It seems like most of us could use a little help with making the process of getting dinner on the table a little easier. Even those of us who enjoy being in the kitchen don’t always have the time that’s needed to get a good meal on the table as often as we would like to. Well I got a little help recently. 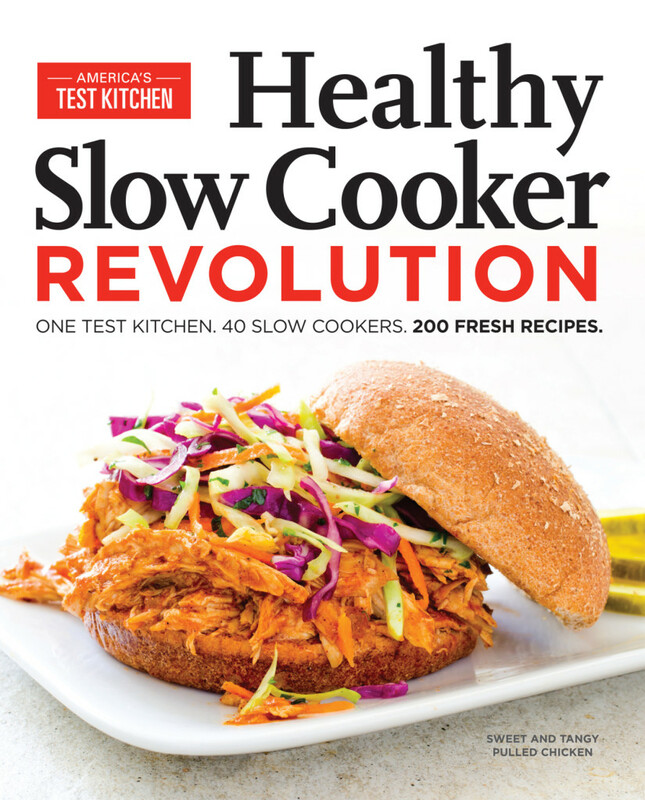 It came in the form of America’s Test Kitchen’s new cookbook, Healthy Slow Cooker Revolution. 200 fresh (and healthy!) recipes. (You can get this same help. Enter the giveaway at the bottom of the post for your chance to win this cookbook!) They have everything from soups to meats to sides to desserts with nutrition information for each recipe. As soon as I glanced through the recipe index, I knew it was going to be hard to settle on one recipe to share. I was right. So, I asked my husband to look through it and give me 2 or 3 recipes that he wanted me to try. I stopped him at 10. Even though I’m only sharing one with you, you can be certain that this cookbook will be getting lots of use in the future! 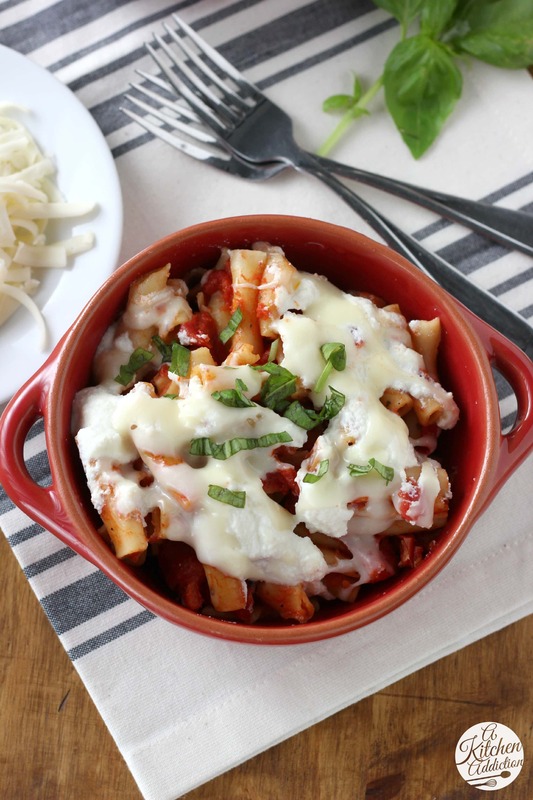 So how did I settle on this slow cooker easy baked ziti? Well, I have always shied away from pasta slow cooker recipes. The pasta either turns out too dry or too soggy. Neither of which are good results! I figured a good way to test and see if this cookbook was any good would be to try a pasta recipe! One of my favorite parts about this cookbook is that at the top of each recipe they have a section called “Why This Recipe Works.” The editors briefly explain the technique(s) used in the recipe along with why they used certain ingredients. The information is very helpful and gives you a better understanding on how to get the most out of your slow cooker experience. This particular recipe explains how to toast your pasta to get an end result of the perfect texture of pasta. And guess what? It works! Other than the quick prepping of the pasta (and chopping of herbs), this baked ziti takes no other prep work than just adding the ingredients to the slow cooker. Super easy. Even though it doesn’t take much work, the flavors make you think a lot of work went into it. Hearty comfort food that requires little effort from me is always a bonus on a busy weeknight! So go ahead, make your evenings little less hectic! Line a slow cooker with an aluminum foil collar and lightly spray with vegetable oil spray. Microwave ziti and oil in a bowl at 50% power, stirring occasionally, until some pasta pieces look toasted and blistered, about 3-5 minutes. Transfer hot pasta to prepared slow cooker and immediately stir in boiling water (pasta will sizzle). Stir in crushed tomatoes, tomato paste, garlic, oregano, ½ tsp salt, and pepper flakes until evenly combined. Cover and cook until pasta is tender, 2-3 hours on high. Remove foil collar. Gently stir pasta, adding hot water as needed to loosen sauce consistency, and season with salt and pepper to taste. Drop spoonfuls of ricotta on top of casserole and sprinkle with mozzarella. Cover and cook on high until cheese is melted, about 5 minutes. Recipe courtesy of America’s Test Kitchen Healthy Slow Cooker Revolution. Enter the Rafflecopter widget below for your chance to win a copy of Healthy Slow Cooker Revolution! *This giveaway is open to Continental US residents 18 years of age and older. Disclaimer: I received a copy of Healthy Slow Cooker Revolution for review purposes. Giveaway is sponsored by America’s Test Kitchen. I’ve never made pasta in a slow cooker either, but I’ve always wanted to try it. Glad to know it works! This looks fantastic and the cookbook sounds wonderful! Sounds great…gotta give it a try! Love ATK recipes! Wow – that is fascinating how you can make the pasta work in the slow cooker! I love learning those little tricks that are quick and easy but so helpful to making a dish turn out. This looks super yummy and easy since it is in the slow cooker – will definitely have to try it! looks yummy…can’t wait to try it! Ooh, I love ATK! My husband and I watch the show religiously. My favorite thing to make in the slow cooker is a steak and vegetable soup — quick and easy. Just throw the sliced steak in the bottom and layer in crushed tomatoes, onion soup mix and canned tomatoes, green beans, carrots and anything else you want. So good and hearty! I haven’t actually used a slow cooker yet. I have my mom’s old one, which I was hesitant to use, and now a newer one, but I haven’t tested it out yet. I was thinking chili, of course, but I’d like to try braised dishes, like osso buco or braised lamb shank, if that’s feasible. I love baked ziti! My mother-in-law has another of the ATC cookbooks and she uses it all the time. I love the slow cooker version of both the cookbook and this recipe!! 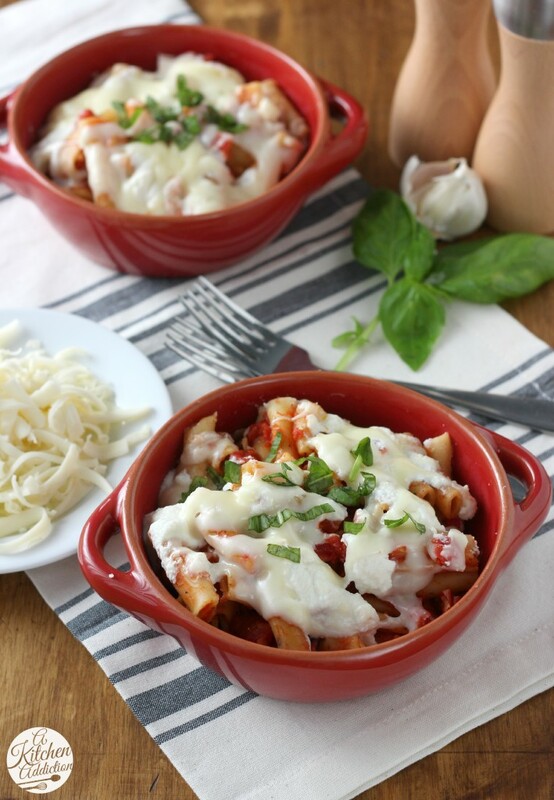 oooooh this ziti looks so cheeeeesy and tasty! I have the original ATK Slow Cooker Revolution and am excited to try this recipe. My favorite slow cooker recipe is chicken enchilada soup, but I would love to try pasta in my slow cooker. Thanks for the giveaway! I love using my slow cooker AND I love pasta, now I can marry the two! My family would probably pick out loads of recipes too! This looks so good Jessica! Chili is my favorite thing to make in my slow cooker. I’m going to have to try this recipe out! My favorite thing to make in my slow cooker is my Thanksgiving dressing! I love sing my slow cooker for soups and stews, but this pasta look amazing too! I’ve always been skeptical of pasta slow cooker dishes too, this is interesting! I’ve never used a foil collar on my slow cooker – do you think it would work fine without that? Looks amazing! I love french toast casserole in the crockpot. It is my family’s favorite. This ziti looks fantastic! I love that it’s made in the slow cooker and can’t wait to try making this! Oh my gosh! I NEED that book!! This looks delicious. You had me at “easy.” I love slow cooker recipes, especially with little prep work needed! This sounds so good Jessica! Cooking pasta in the slow cooker has always made me nervous, but yours doesn’t look overcooked and soggy! This looks great! mmm. 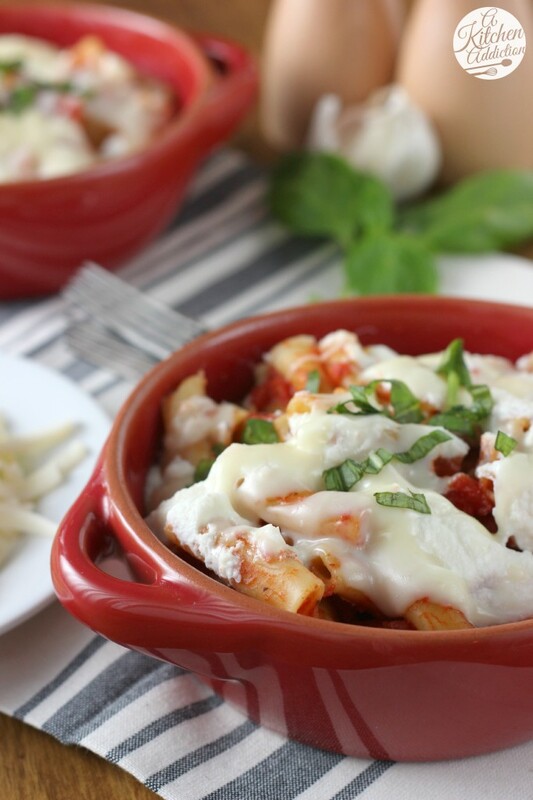 ziti is one of my favorite pastas! I’ve been afraid to try pasta in the slow cooker too, but I think for this recipe I might! I have the America’s Test Kitchen Cooking Light cookbook and love it! The science behind cooking is so interesting! Mmm…second pasta recipe I see today! We should definitely use our slow cooker more, I never knew you could make pasta in it. Oh I love ziti! I’ve never tried making it in the slow cooker before, but that’s such a great idea! I definitely need to give this one a try. This looks so good! I need to make it…and get that book! I love a beef tips and noodles cooked in the slow cooker! 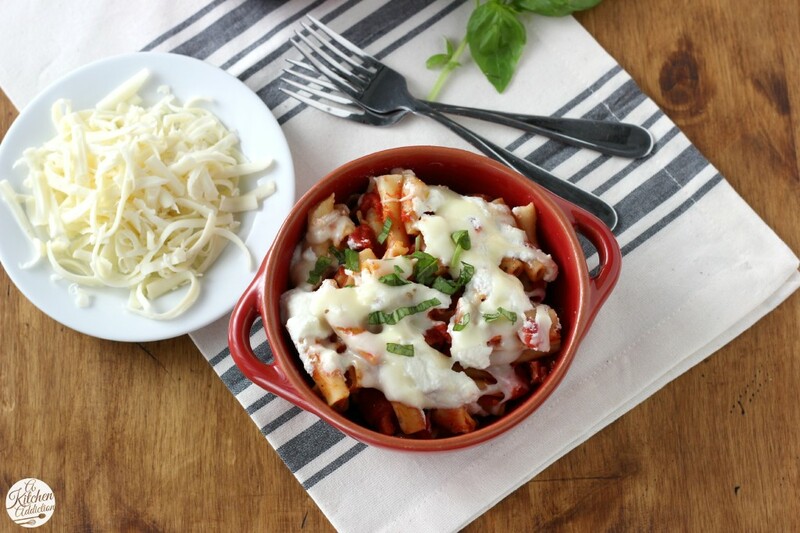 Your baked Ziti looks great! Mmmm, that recipe sound terrific! 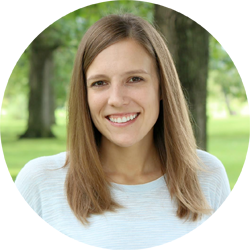 I love the easy of crock pots – can’t wait to try it! My favorite slow cooker recipe is pulled pork. Homemade Ziti is one of my most favourite, go-to dinners! The best comfort food, and i absolutely love that this is cooked in a slow-cooker! I recently made my first slow cooker recipe. It was roast beef for sandwiches including the au jus sauce. It was AWESOME!!! I love making roasts in the slow cooker! I like making shredded chicken, pork or beef with a mexican flare for tacos. My favorite Slow Cooker meal is called Hawaiian Chicken. It is sweet, spicy, sour so delicious! We make it at least once a week in our family. We love it that much! We serve it over rice. I Love making my pulled pork! I always get complements every time someone eats it! It’s my favorite meal to make in my slow cooker. This would be a great accompaniment to the slow cooker I’m planning on purchasing. What a great tip! I’m going to have to try to toast my pasta next time! Looks great! Oooo pasta in the slow cooker! What a great idea. I always just make chilli in my slow cooker but I am excited to diversify. I’ve made lasagna in my crock but never baked ziti! This looks awesome! I love making candied sweet potatoes in the slow cooker. Favorite crock pot recipes usually involve meat (beef or pork roast). Cauliflower florets covering the bottom of the pot, followed by thick carrot coins, followed by chopped celery, followed by arnd 1 – 1/5 cups water, followed by fresh rosemary and fresh sage, followed by the seasoned meat, followed by thinly slice onion. When roast is done cooking, remove onions, roast and herbs. Using my immersion blender, I blend all the remaining ingredients with all the yummy meat juicy for perfect gravy. Yum!!! Barbara, how large a cut of meat … 3-4 lb or so? Sounds great. Steve, yes! that’s sounds right. Oh and the water amount should have said 1 to 1.5 cups. We just made this for today’s dinner. Yum! I love slow cooker white chicken chili! Lately my fave has been bacon jam because…bacon jam. I like to make oatmeal in the slow cooker. I fixed a Beef & Vegetable Stew in the crock-pot. It had butternut squash, carrots & parsnips. I love to make bbq pulled pork in the slow cooker espcecially when expecting a crowd of people. I love making pork shoulder in my slow cooker! I love making spiced pumpkin oatmeal in my slow cooker. Overnight oatmeal is the best. My favorite slow cooker meal is a AT K country chicken captain which uses mango chutney. I would love that recipe!! Would you mind sharing? My favorite is a recipe called Chalupa.. it’s a pork roast slow cooked w chili’s, cumin and served over Fritos or Tortilla Chips, with lettuce, tomatoes, olives, cheese, sour cream, salsa and avocado. Very much like a tostada. Yum!! Barbecue pulled beef for sandwiches! I would LOVE to win this book, thank you! I like to make veggie lasagna in the slow cooker. So good! Hot spiced cider in the crock pot for the holidays! Easy clean up and it doesn’t take up valuable oven top space. Pork roast with potatoes and carrots. My favorite slow cooker recipe is chili! I love slow cookers, but even more I LOVE Pressure Cookers! Probably because I have no patience what so ever lolll. Great recipe! ??? ?